Planning and scheduling tools within STRUMIS allow users to profitably and effectively manage projects from every aspect. STRUMIS provides a powerful and user friendly solution so key information on project forecasting can be established, edited and tracked during the course of the job. 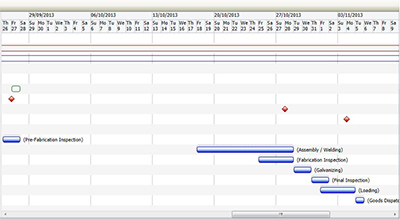 In depth date planning facilities allow for easy breakdown of projects at in-house and subcontractor level. Production may be scheduled via user defined process packages which provide accurate timings and costs for the fabrication, delivery of items. Visualisation of project planning and sequencing is undertaken via integrated and independent BIM model viewer packages. STRUMIS is an all encompassing steel fabrication management information system that harnesses the information flow and work processes through the steelwork contract between departments, suppliers and clients; from estimate tendering, through procurement and production into construction.